Chennai: There were about 4,64,674 cases of road accidents reported in India in 2015. Of these, about 4,82,389 persons were injured and 1,48,797 deaths were reported, according to the National Crime Research Bureau (NCRB, 2016) report. Death due to road accidents had increased by about 5.1% over the previous year. Results of a report by The Union Ministry of Road Transport and Highways (MoRTH, 2016) show that more than 40% of such deaths occurred due to human error or driver fatigue. Majority (~53.2%) of the road accidents have taken place on National and State highways. Driver fatigue may be defined as decline in driver’s performance. A driver’s performance and behavior is greatly influenced by physical and cognitive factors. Its contribution to individual cases is hard to measure post-facto and therefore is often difficult to conclusive ascertain the cause of crash. Therefore, it is important to know about driver’s behavior, fatigue, and performance to give appropriate interventions to avoid road accidents. 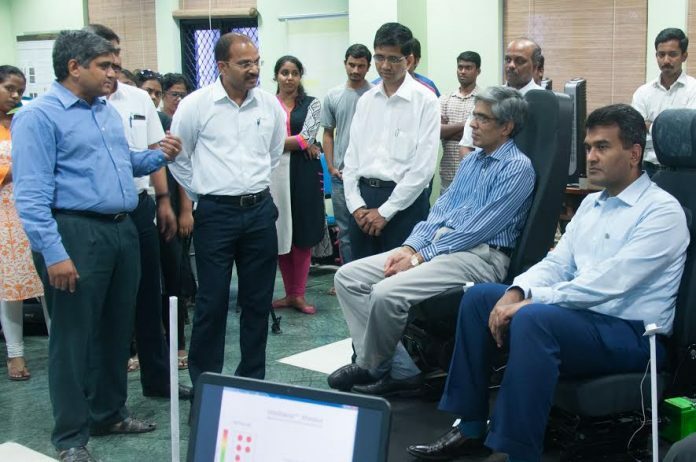 IIT-M and Harita Seating Systems Limited (HSSL) have joined hands to address this epidemic of road accidents by collaboratively developing viable and cost effective products to enhance road safety using the technology and knowhow developed by the Rehabilitation Bioengineering Group, Department of Engineering Design, IIT Madras. First of the products in this initiative, Intelliseat™ has been developed and is being launched on this occasion for commercial use. Intelliseat™ is an IoT (Internet of things) device that monitors the driver 24×7 and is confined within the existing footprint of regular seats. This system operates independently and can be used for in-vehicle information of status as well as help a central tracking by fleet owners. It can also be used for driver training and fleet risk evaluation, which would eventually have a bearing on the overall fleet insurance and ownership cost.